A wealth tax is what it sounds like: a tax imposed not on income, but on wealth. The standard economic definition of wealth includes both nonfinancial assets like real estate and financial assets like stocks and bonds. Thus, a wealth tax doesn't care if the value of someone's wealth went up or down in the last year/ It is not a tax on the transfer of wealth to others, like an inheritance tax or a gift tax. It is just imposed on the amount of wealth. In the US, property taxes are a cousin of a part of a broader wealth tax, in the sense that they are imposed annually on the value of a property, whether the value rises or falls. But they are not at true wealth tax in the sense that they don't differentiate between someone who own their home debt-free--and thus all the value of the home is wealth--and someone who is still paying off the mortgage, where only the equity you have in your home is wealth. The inheritance tax is also a form of a wealth tax. For the OECD, the bottom line is that it is reasonable for policy-makers to be concerned about the rising inequality of wealth and large concentrations of wealth But it also points out that if a country has reasonable methods of taxing capital gains, inheritances, intergenerational gifts, and property, a combination of these approaches are typically preferable to a wealth tax. The report notes: "Overall ... from both an efficiency and an equity perspective, there are limited arguments for having a net wealth tax on top of well-designed capital income taxes –including taxes on capital gains – and inheritance taxes, but that there are arguments for having a net wealth tax as an (imperfect) substitute for these taxes." The most prominent proposals for a US wealth tax would apply only to those with extreme wealth, like those with more than $50 million in wealth. However, European countries typically imposed wealth taxes at much lower levels of wealth. 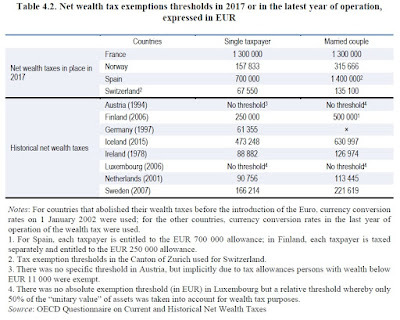 Here's a table showing how much wealth is exempt from the wealth tax in European countries. Clearly, most countries with such taxes were applying them to wealth well below $50 million. It's interesting, then, that in these European countries the wealth tax generally accounted for only a small amount of government revenue. The OECD writes: "In 2016, tax revenues from individual net wealth taxes ranged from 0.2% of GDP in Spain to 1.0% of GDP in Switzerland. As a share of total tax revenues, they ranged from 0.5% in France to 3.7% in Switzerland ... Switzerland has always stood out as an exception, with tax revenues from individual net wealth taxes which have been consistently higher than in other countries ..." However, Switzerland apparently has no property tax, and instead uses the wealth tax as a substitute. The fact that wealth taxes collect relative little is part of the reason that a number of countries decided that they weren't worth the bother. In addition, it suggests that a US wealth tax which doesn't kick in until $50 million in wealth or more will not raise meaningfully large amounts of revenue. Why do wealth taxes imposed on what seem to be quite low levels of wealth collect so little revenue in various European countries, especially during the last few decades when high-wealth individuals as a group have done pretty well? The answer seems to be that when countries impose a wealth tax, they often typically create a lot of exemptions for certain kind of wealth that aren't covered by the tax. Each of these exemptions has a reasonable-sounding basis. But every exception also creates a potential loophole.